As we seek to reintroduce natural systems into the urban landscape, and rising energy costs make local food increasingly desirable, intensive urban agriculture is shaping up to be a critical component of self-sufficient cities. Jetson Green reports on the latest vertical farming proposal, this one from Seattle: the Center for Urban Agriculture, conceived by local firm Mithun. The winner of the Cascadia Region Green Building Council’s Living Building Challenge, Mithun’s proposal deftly integrates human and natural systems to function like a living organism. 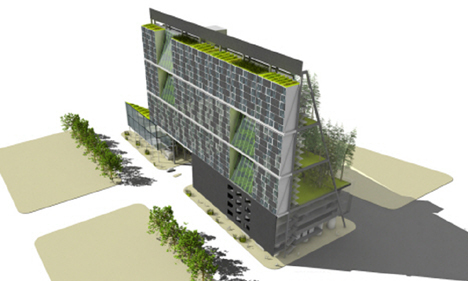 The proposal aims for self-sufficiency in energy (via PV panels with hydrogen storage) and water (via rooftop rainwater harvesting), while providing more than 300 affordable housing units and 40,000 square feet of vertical farming – all on a 3/4 acre footprint. Of course, the Center for Urban Agriculture is just a proposal, and even if it were to be self-sufficient in energy, water and food, the details of how it would work from a financial perspective are far from clear. As I delve deeper into my ecological site plan for the Domino Sugar Factory, I’ll be taking a close look at proposals like Mithun’s and Dickson Despommier’s Vertical Farm Project to see just how workable they are. There is a system that is being implemented throughout cities and towns in the U.S. and Canada now. It’s called SPIN-Farming. SPIN is a commercial sub-acre farming system that makes it possible to earn high income from sub-acre land bases. Minimal infrastructure, reliance on hand labor to accomplish most farming tasks, utilization of existing water sources to meet irrigation needs, and situating close to markets all keep investment and overhead costs low. SPIN therefore removes the 2 big barriers to entry for first generation farmers – they don’t need a lot of land or money – and it incorporates agriculture into the built environment in an economically viable manner. By re-casting farming as a small business in a city or town, SPIN-Farming is helping to make agriculture an integral part of urban and suburban economies, rather than isolated outside of them.